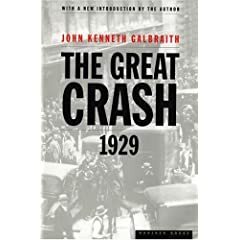 So it is with impeccable timing that about 3 weeks ago I started listening to John Kenneth Galbraith’s “The Great Crash: 1929.” (Indeed, I wish I had similar impeccable timing when planning my RRSP, 401k and stock purchases). Obviously the events of the last week, and more precisely the events of yesterday make this essential reading for everyone. By quirk of luck (due to a recommendation by Mark Surman) I have also been reading Emergence: The Connected Lives of Ants, Brains, Cities, and Software by Steven Johnson. Emergence is about “the way complex systems and patterns arise out of a multiplicity of relatively simple interactions.” Possibly the most easily understood exmaple of emergence is seeing how ants or termites can create complex societies based on a few simple rules. Interestingly, although Galbraith and Johnson almost certainly never met, and their books were written over 50 years apart, they are fundamentally writing about the same thing. John Kenneth Galbraith’s The Great Crash is about an emergent system – the speculatory stock market bubble that lead to the 1929 crash. Indeed what makes reading these books simultaneously so interesting is observing how Galbraith describe an emergent system without the language and frameworks available to Johnson 50 years later. Consequently, Galbraith’s book is hints at a larger system even as he struggles to describe how the decisions of hundreds of thousands of individuals could be simultaniously coorindated but not directed. He intuits a distributed system, but simple can’t describe it as accurately as Johnson. There was no one who caused it. Remember that. Galbraith wants to pin it on something large and decentralized but can’t put his finger on what it is. Consider this line “No one engineered the speculation that preceded it. Both were the product of the free choice and decisions of thousands of individuals. The latter were not lead to the slaughter. There were impelled to it by the seminal lunacy which has always seized people who are seized in turn with the notion that they can become very rich.” Throughout his book Galbraith keeps talking about a “collective lunacy” but cannot account for it. As he concedes, the desire to become rich is ever present, something in 1929 triggered a larger hysteria. Some emergent property made it vogue. This is what we need to understand. In 1929 – as well as today – a group of people lived and worked in a system that had powerful incentives that encouraged them to engage in risky practices (in 1929 it was investing in stock on margin, today it was lending people money who simply could not afford it). Finding the people will achieve little compared to understanding the basic set of rules that created these incentives – removing the people will do little. Managing the incentives will do everything. A big part of this may involve new regulations, but probably more importantly it requires recognizing that whole new business models are required as these shape incentives far more than regulations. No business wants to go through this type of crises again. A business model that insulates them against it will be the one to copy. This is why Umair Haque’s post is so important. Opaque economic intelligence (not so sure about this one). Yikes, so we are batting 3, maybe 4 out of 5. My biggest fear and suspicion is that this bailout, if it occurs. Will probaby not “rescue” the system. It will simply give us breathing room to adapt the system. Certainly that would have been the case in 1929, and history very much looks like an emergent system, beyond the control of a top down state, has once again taken over. This entry was posted in book review, reviews, united states and tagged book review, complexity theory, crash 1929, economics, emergence, Galbraith, great depression, history, john kenneth galbraith, reviews, Steven Johnson, stock market bubble, united states on September 30, 2008 by David Eaves. 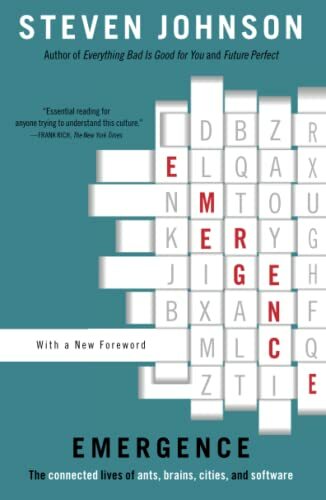 The Emergence: The Connected Lives of Ants, Brains, Cities, and Software link is broken. Hi Terry – Just tried and it worked for me. It takes you my reading list. From there there is a link to Amazon.ca and reviews. Good post. What I think we are getting at and need is a fundamental shift in mindset. Ervin Laszlo's book Macroshift looked at the interplay of mindset and technology in the evolution of human civilizations – which culminated in the period of 2000-2010 being a critical juncture for our civilization.We're seeing this new mindset emerge in the common values set underneath the open, envirosocial change, and social tech movements. The shifting of our systems, is inevitable and necessary. Drastic ones like we are experiencing in the financial markets are painful and will have some deep social implications, but they are also opportunities to new systems based on new mindset to take root and define the course of our future. I think that the more likely state of affairs is that the global economy will seek equilibrium, however, externalized control introduces instability and provides potential means to force markets from one equilibrium to another. Pingback: AgendaCamp: Citizen-driven economic intelligence : Remarkk! This is what we need to understand. In 1929 – as well as today – a group of people lived and worked in a system that had powerful incentives that encouraged them to engage in risky practices (in 1929 it was investing in stock on margin, today it was lending people money who simply could not afford it). Finding the people will achieve little compared to fidelity 401k understanding the basic set of rules that created these incentives – removing the people will do little. Managing the incentives will do everything. A big part of this may involve new regulations, but probably more importantly it requires recognizing that whole new business models are required as these shape incentives far more than regulations. No business wants to go through this type of crises again. Despite having different reasons both recessions have a lot in common and as grahamhmichels mentioned “a group of people lived and worked in a system that had powerful incentives that encouraged them to engage in risky practices” both recessions were caused my taking risks.